DRUPA 2016 closed its doors on a successful note 10 June in Düsseldorf, in Germany. No less than 260,000 visitors helped the fair achieve a resounding success. This included great encouragement for the ink-jet printing sector. Here we’ll take a look at the elements that contributed to the success of this singular event. This 2016 edition bears witness to the development of ink-jet printing. Already well represented at DRUPA 2012, ink-jet and digital printing stole the limelight at this year’s show. All the manufacturers presented digital and ink-jet printing solutions, compared to preceding editions where only a handful of stands had invested in digital. Manufacturers have assessed trends in the ink-jet printing sector and adapted these to companies’ needs. This was the conclusion, in any case, already reached by graphic industry professionals present at the 2012 fair. They were surprised to see the spread of digital solutions at traditional and other stands. A printing technique appreciated for the advantages it creates, and particularly for its lesser material investment. The president of KBA and coorganiser of DRUPA, Claus Bolza-Schünemann, was pleased to welcome the holding of the latest graphic and digital printing fair. He was also delighted with the continual increase in the number of visitors at this new edition, and of the exchange quality between professionals and prospects. He appreciated the efforts achieved by manufacturers to better meet visitor expectations and their needs. For its part, the KBA company registered a success with customer orders amounting to several hundred million euros, as well as its particular achievement for sheet-fed offset printing. Numerous contracts have been concluded for this type of printer in each of the available formats. Also of note was the encouraging reception for the presentation of RotaJET L digital equipment, which constituted a record affluence for the KBA stand. The company president proclaimed this year’s DRUPA as the best edition for his company since the 2000 edition. 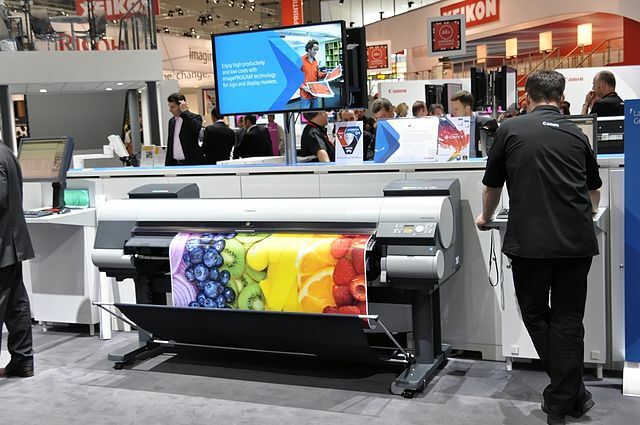 Digital, key element for the future of printing? There is little doubt that digital has a big future in front of it, and that it represents the future of printing for all the manufacturers. Heidelberg has already signaled this and wishes to increasingly develop its digital printing solutions so that they will account for 20% of its revenue in the near future (compared with an objective of 10% in 2014). It is up to manufacturers to find cutting edge solutions and technologies, which will allow the construction of even more innovative digital presses. The make-ready time reduction and automatisation of manual operations are the principal challenges for constructors. An open invitation for the next graphic printing fair to be held in 2020 is cordially extended to view manufacturers’ latest innovations and developments.